Hartmarx (HMX) was sold to Authentic Brand Group. Hartmarx has a proud 100-year tradition of quality, innovation, style and customer service - a tradition that is both the foundation for their success in the past and their chief distinction today. From high-profile, branded tailored clothing that defines the modern workplace, to contemporary, trend-right sportswear and women's apparel, Hartmarx brings differentiation and distinction to every consumer segment they serve.. 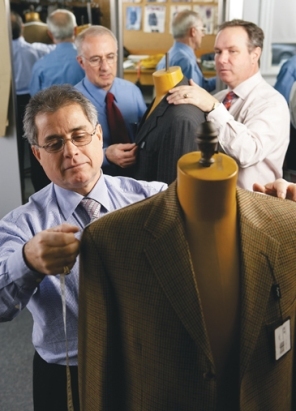 While their initial success was largely fueled by the Chicagos urgent need for clothing, their reputation for quality steadily grew. In 1879, Marcus Marx joined the partnership, but it was the 1887 arrival of Joseph Schaffner that gave the company the name that would follow it for more than 100 years: Hart Schaffner & Marx. Schaffner's arrival ushered in an era of creativity and industry firsts. Early innovations included standard pricing, selling from swatches instead of cumbersome trunks, the first national men's apparel magazine advertisement, and, in 1936, the first zippered pants. Hart Schaffner & Marx survived the Great Depression and went to war twice, turning over its plants for U.S. uniform production. In the 1950s and 1960s the Company conquered new fronts, making its first major acquisitions, pioneering the celebrity endorsement with brands including Jack Nicklaus, and building upon its reputation as "America's First Name in Tailored Clothing." In 1983, the company changed its name to Hartmarx to reflect its diverse holdings, with Hart Schaffner & Marx remaining a flagship label. Today, Hartmarx's strengths lie where they always have, in producing the apparel its customers seek. From top-branded tailored clothing that defines the modern workplace to trend-on sportswear, women's apparel, and men's apparel, Hartmarx brings style and momentum to every segment it serves. One thing remains the same. As in 1887, Hartmarx thrives on a core quality: the recognition of opportunity. Like the Company's Chicago headquarters, it's at the heart of American commerce itself. Hey, if you work at Hartmarx and have more information to add about your company, please do not hesitate to let us know.